Why Are We So Attracted To Minimalist Branding? Scroll through an Instagram feed, and you'll most likely notice something starkly similar. 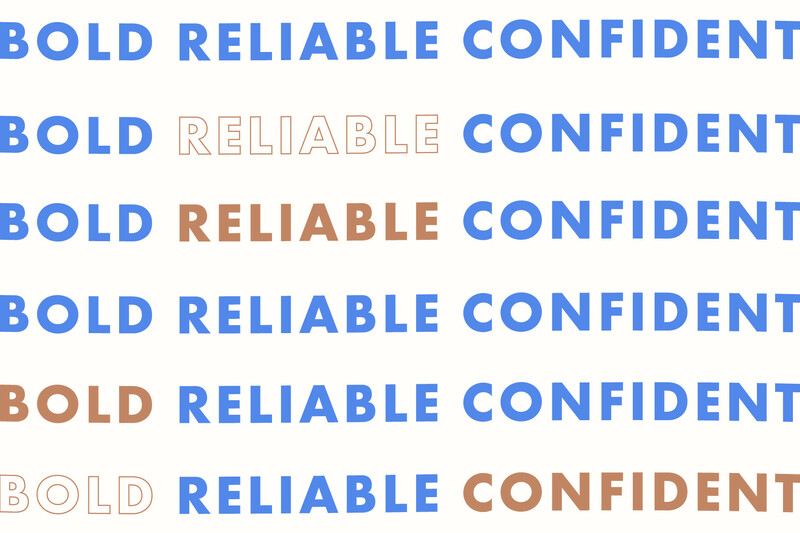 There's a select choice of hues and typefaces that seem repeated all around. It feels clean and sleek, with an occasional dose of pastel. Minimalism has taken over branding and it looks like it might be here to stay. But how did this style arrive and why are we so drawn to the look? From packaging to marketing campaigns, there has been a total shift to a minimal aesthetic. It feels modern, stylish, and uniquely millennial. From newer companies like Milk Makeup to rebrands by giants like Google and Mastercard, everyone is looking to tap into this look. Even we recently got a new logo! Minimalism is just what feels like the natural choice for anyone building a brand these days. "I think the emphasis on style and design is more prevalent than ever," notes Katie Conovitz, founder and CEO of twelveNYC, a leading creative consultancy with clients like Glossier, Ouai, and The Wing. "If product or packaging is overly branded, it deters from the creative ingenuity of the actual product design." "Brands are looking to differentiate in a very crowded, image-heavy landscape," she explains. "Scaling back the ‘noise’ around the branding and presenting a clear, intentional narrative allows for quicker recognition and ultimately adoption." Perhaps we can look to social media as the source of this change. These narratives now cross a variety of platforms, and a customer's ability to engage directly with teams has lead to a rise in corporate transparency and engagement. Companies like Everlane can give you behind the scenes looks at how its ethical and sustainable products are made through videos and posts, while Instagram accounts like diet_prada can call out copyright issues amongst fashion designers. Not only can we clapback at these brands, but we also can also tout them on our feeds and show off that minimal iconography. "We are strong believers that brands must remain consistent in curating their core evergreen items to serve as lasting and tangible brand identifiers," shares Conovitz. "Whether it’s a branded pouch to house the product, a ubiquitous shopping bag, distinguished zipper pulls, or invariable packaging design, these collectible, covetable, and recognizable items seed a viral brand story. Designing core products with this intent eliminates the need for trivial and senseless branding, making for a more impactful and enduring consumer relationship." While newer companies are heading towards minimalism right off the bat, a few more established ones have made the change to create this more direct narrative. One example is Hannah Collins Design. The S.F.-based interiors business behind some of the city's most popular restaurants recently changed its name to ROY, and got a whole new black-and-white look along with it. "It was something I always wanted to do, but never made it a priority," shares principle designer Hannah Collins, who co-founded the firm with her sister Emily. "As the company grew, I knew I didn’t want my personal name to be in the company’s name. Hannah Collins Designs always felt too small and residential for where we wanted to go. We wanted to create a brand identity that reflected the diverse projects we have as well as evoked the spirit of the people who work within the organization." As the co-founders thought about what direction they should take, creating a clear and representative voice and aesthetic was key. "One night, Emily and I had a meeting with our graphic designer Elizabeth West and one of our senior designers Kara to discuss what we really wanted out of the rebrand. We knew we wanted it to be easy and simple to say and read," says Collins. "We brainstormed that night writing down all the words that we felt really defined who we were as a company," she explains. "We started talking about what a big influence our grandfather was on us as entrepreneurs and so we threw our his name and words we associated to him. His middle name was ROY, and we all loved the way it sounded and how simple it was. It felt masculine in a way that complimented our badass all-female team." "Part of this exploration were words like bold, reliable, and confident," Collins notes. "So we really wanted the look and feel of the rebrand to reflect that. Minimalism and clean lines seemed to fit right with those words and also fit right with our aesthetic as a design firm." Since making the change, ROY has seen a surge in engagement. "We did an entire website overhaul that we are really proud of, and we have seen an increase in visits and the amount of time people spend on the page," the co-founder says. "I think inherently people are really attracted to simple, clean bold typography." So why is minimalism so attractive to us? Conovitz says it nice and concisely. "Bottom line, there is no time to tell a long-winded story. Develop compelling product with a tight story and it will stand out in a very crowded landscape."